The first of three EMB 145 Airborne Early Warning and Control (AEW&C) aircraft ordered by the Indian Government performs its maiden flight. The EMB 145 jet is modified to integrate with the Airborne Early Warning and Control (AEW&C) system developed by DRDO. 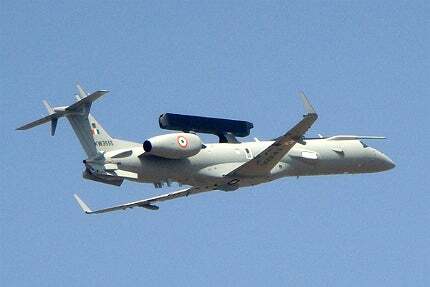 The DRDO EMB 145 Airborne Early Warning and Control (AEW&C) aircraft is equipped with indigenous mission systems. DRDO AEW&CS aboard an Embraer EMB-145 at Aero India 2013. Image courtesy of Pritishp333. DRDO developed a multisensor airborne early warning and control (AEW&C) system on a carrier jet, providing an airborne surveillance system in collaboration with CAB (Centre for Airborne Systems) for the Indian Air Force. It is the first native AEW system developed by DRDO and CAB. It was completely developed and built using the native technology platform, EMB-145. The system enables the armed forces to communicate with fighter jets and other AEW&C assets, while it also allows for Search and Rescue (SAR) operations, mission planning as well as record and replay for post mission analysis. The jet platform selected for the DRDO AEW&C system is the Embraer EMB-145 from Brazil. The jet is modified to integrate mission systems. The cabin is also modified to house five operator work stations, four racks, additional fuselage fuel tanks and five rest crew seats. The modified aircraft has additional power unit to power onboard mission systems. It can also support the in-flight re-fuelling system for extended endurance of the mission. Two radiating planar arrays are mounted above the fuselage of the EMB-145 to provide 240° coverage. The arrays are fixed in back-to-back arrangement in an active antenna array unit (AAAU). The AAAU is designed to fit 10×2 antenna array panels, 160 Transmit Receive Multi Modules (TRMM) and all the supporting devices, including power supply units and control units. Each TRMM is made of eight compactly fused transmit receive modules to ensure high density installation of 160 TRMMs. "The jet platform selected for the DRDO AEW&C system is the Embraer EMB-145 from Brazil." The Government of India approved the AEWCS programme after the Indian Air Force (IAF) and Defence Research and Development Organisation (DRDO) jointly studied the feasibility of the AEWCS. Three EMB-145s were ordered by the Indian Government. The indigenous radar system of the DRDO was integrated after the aircraft was modified accordingly. The first aircraft AEW&C platform developed for India was unveiled at Embraer’s headquarters in São José dos Campos in February 2011. The fully modified aircraft equipped with Active Electronic Scanning Array (AESA) radar and other electronic payloads made its first flight in December 2011 at Embraer’s facilities. It incorporated more than 1,000 mission system components manufactured by DRDO. Embraer delivered the first fully modified EMB-145 aircraft to accommodate the Indian AEWCS in August 2012. The company delivered two of three modified EMB-145s to DRDO in 2012. The two aircraft were installed with the native AEW&C system for mission system testing. The aircraft will be delivered to the IAF by 2014, once the system passes the tests. Mission system control (MSC) is the brain of the AEW&C system, as it incorporates all the data from sensors and other systems to control the whole system. It assesses threats using data received from the on-board sensors and other sources, and presents the Air Situation Picture (ASP). It manages the whole communication system of the AEW&C system. The MSC can record the data and play back the same for conducting mission analysis. The Intercept Control Segment (ICS) integrated into the MSC will carry out recovery operations by guiding interceptors and vector strike aircraft. The system mainly comprises of a primary radar and secondary surveillance radar (SSR/IFF). The SSR provides Electronic Support Measures (ESM) and Communication Support Measures (CSM). It identifies and classifies the threats based on the emissions from them, and also serves as a Friend or Foe identification system. "It is the first native AEW system developed by DRDO and CAB." The Radar Warning Receiver (RWR) which is integrated into the ESM system, Missile Approach Warning System (MAWS) and Counter Measures Dispensing system (CMDS) forms a Self Protection Suite (SPS). The Data Handling and Display System (DHDS) will present the Air Situation Picture on Operator Work Station (OWS) and will provide communication facilities to interact with the system. The AEW&C system uses C band data link, Ku band SATCOM and a set of five V/UHF frequencies. The C band and Ku band links form redundant links for air to ground communications. The V/UHF frequencies are used for air to air data and voice communications. The communication systems allow the AEW&C system to communicate with satellites, radar ground control stations and more than 40 fighter aircraft. The Tejas single-seat, single-engine, lightweight, high-agility supersonic fighter aircraft has been undergoing flight trials in preparation for operational clearance, and by March 2012 had flown more than 1,816 test flights up to speeds of Mach 1.4.